Yesterday, Deep Green Resistance members Kyle Lee and Dave Hyde had their charges dropped in Whatcom County District Court. 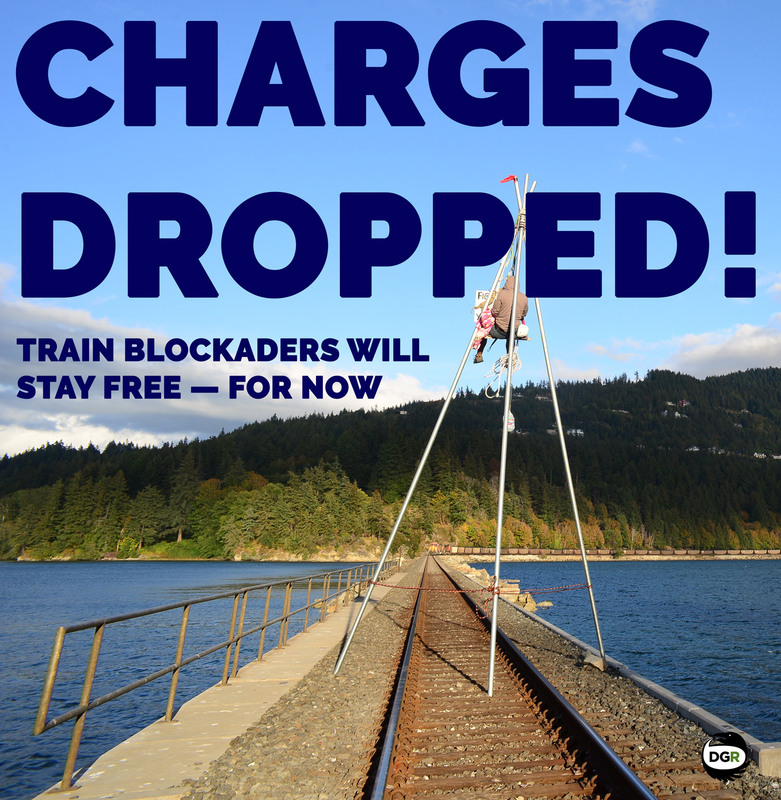 They were originally charged with trespassing, resisting arrest, and obstructing a train in connection with a 12-hour coal train blockade that took place on August 27th. The blockade was an attempt to directly interfere with and halt the extraction, transportation, and burning of coal, and utilized knowledge of the land, terrain, and other tactical advantages to be as effective as possible. Last week, another Deep Green Resistance member, Spencer Morgan, who was charged in Bellingham municipal court, also had his charges dropped. In both cases, the charges were dropped “without prejudice,” which means that the case could be refiled by the State of Washington or Federal prosecutors within the next several years. Prosecutors referred the cases to higher courts in the hopes they will pick them up. Coal is among the dirtiest fuels on the planet, and is the largest single contributor to global warming which threatens life on the planet. Scientists warn that the climate is approaching multiple “tipping points” that, if surpassed, threaten to make climate change self-sustaining despite any efforts to reduce emissions in the future. The coal in the train that was stopped in Bellingham in August is believed to be from the Powder River Basin, a complex of mines in Montana and Wyoming that supplies nearly half of all the coal mined in the United States. The Powder River Basin is traditional Cheyenne and Arapaho land. 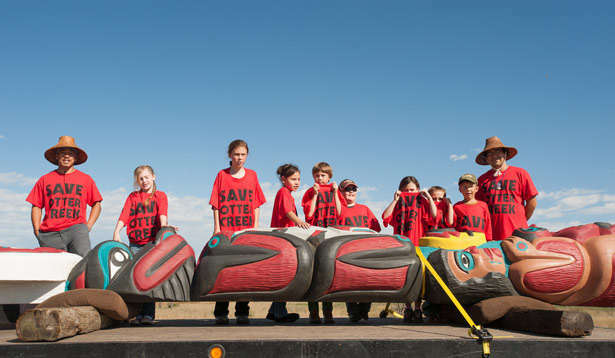 Members of the Northern Cheyenne nation stand over a totem pole crafted by Lummi master carver and lifelong land protector Jewell James as part of a multi-nation protest against Powder River Basin coal extraction and fossil fuels in general. Photo by Paul K Anderson. Whatcom County has long been a thorn in the foot of fossil fuel companies. Earlier this year, the Army Corp of Engineers denied a permit to construct a massive coal export terminal just outside of Bellingham after years of opposition from the community. The permit denial referenced the treaty fishing rights of the Lummi nation, which has inhabited the area since time immemorial. Many Lummi people still fish and gather shellfish and other food from the land. The Lummi led the fight against the Cherry Point terminal, and the Bellingham community packed the house at every public meeting related to the project. In 2012, the Lummi Nation formally announced their opposition to the proposed Cherry Point coal export terminal by burning a symbolic check, stating that no amount of money could buy their support. Following this example, the Bellingham community has been largely supportive of the blockade that took place in August. Many community members, including families with children, climbed into kayaks and other small boats and visited the protestors on the Chuckanut Bay rail trestle in August. Spencer and Kyle were interviewed on local radio soon after the action, and a spokesperson was interviewed on an Idaho-based climate radio program shortly thereafter. In regards to the charges dropped against the three activists, the fight is not over. It’s possible that the opposition is gathering resources for a broader case. For now, the three activists will remain free. This entry was posted in Culture of Resistance, Obstruction & Occupation and tagged Coal, Courts, DGR activity & statements, Dave Hyde, Kyle Lee, Rail, Spencer Morgan, Washington. Bookmark the permalink.